“Information is power,” states J. Edgar Hoover (Leonardo DiCaprio), legendary honcho of the Federal Bureau of Investigation, the man who armed agents, catalogued criminals, initiated scientific crime-fighting (including fingerprinting), and who assembled private dossiers on anyone and everyone – including the eight Presidents he served – who might undermine his own position of, well, power. But when it comes to Hoover’s private life, information is scarce. Director Clint Eastwood and screenwriter Dustin Lance Black ( Milk ) have made no secret of plugging gaps with educated guesstimates, and one of J. Edgar ’s key themes is the prismatic nature of truth. Unfurling in flashbacks (and flashbacks within flashbacks) as the septuagenarian director dictates his memoirs, Hoover emerges as an unreliable, self-promoting narrator, with the film spanning his induction into the US Justice Department in 1919 to his death in 1972. The main focus is Hoover’s handling of the Bolshevik Bombings in 1919 and 1920 (the start of a lifelong crusade against communism), his involvement in the Lindbergh kidnapping in 1932 and his running battle with the superstar bank robbers of the Depression era. The tumultuous ’60s (Kennedys, Civil Rights) receive limited screen time, while the ’40s (WW2) and ’50s (McCarthyism) don’t figure at all. Which is not necessarily a criticism. Squeezing a 48-year career into two-and-aquarter hours, Eastwood selects from the political to make room for the personal. In fact, J. Edgar ’s emphasis is how this innovative, exacting, stylish, magnetic, loyal, repressed, paranoid man was shaped by his mother (Judi Dench) and aided by two lifelong confidantes, secretary Helen Gandy (Naomi Watts) and protégé Clyde Tolson ( The Social Network ’s Armie Hammer). The latter was Hoover’s great love – a relationship not consummated in the film but rather comprising soft-eyed glances and tender touches. 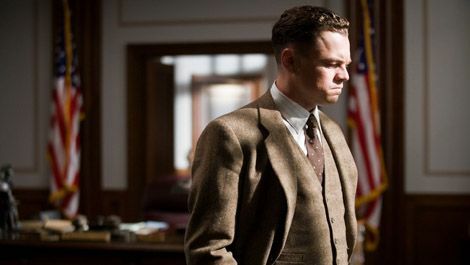 As you’d expect from Eastwood, J. Edgar is a classically made biopic graced with potent performances that even poke through the exaggerated OAP make-up. Considered with Clint’s westerns and 2006 WW2 diptych Flags Of Our Fathers / Letters From Iwo Jima , it again marks him out as an accomplished storyteller and a significant chronicler of American history.